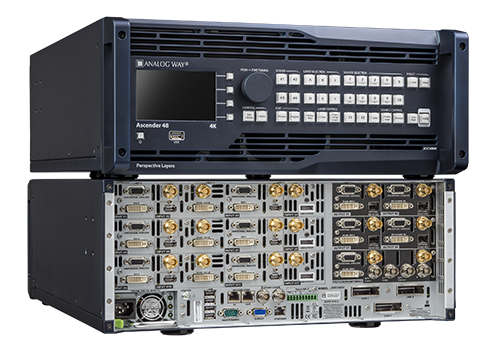 Analog Way will unveil its own range of premium media servers and showcase its high-end video processing solutions at ISE 2018, from 6 to 9 February in Amsterdam, Netherlands. Booth #3-B130 will be organized around demos showcasing how Analog Way’s portfolio of image processors and media servers helps create high-performance live presentations and premium system integration projects. The stand highlights will include several models from the Picturall™, LiveCore™ and Midra™ series as well as Analog Way’s premium multi-format converter (VIO 4K) and event controllers (Vertige, Control Box², AW VideoCompositor). Following the recent acquisition of Picturall, Analog Way introduces its own range of Premium Media Servers. 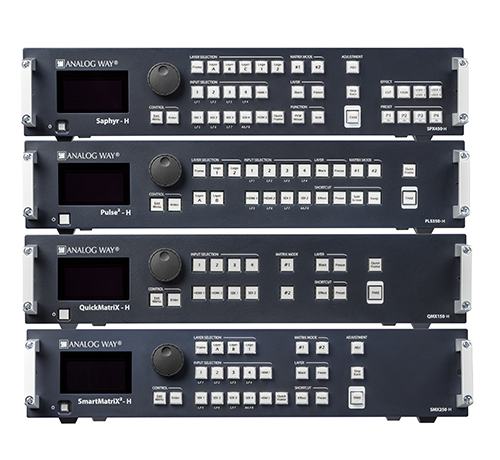 Built on Analog Way’s long experience in ruggedized image processing hardware used for fixed installations and live events, the new Analog Way Picturall series has been designed to provide a robust, heavy-duty platform and deliver optimized uptimes and durability. This new range is based on the Picturall rock-solid Linux software engine, result of 10 years of R&D development and field experience and renowned for its extreme reliability, easy setup and flexible control solutions. With resolutions up to 8K, cutting edge uncompressed playback performance and the ability to drive a large number of 4K@60 projectors or LED processors from a single server unit, the new Analog Way media servers are the natural choice to drive corporate events, live shows, high-end theatre productions or large-scale digital signage projects around the world. Ascender 48 - 4K - PL is a high-end 4K seamless switcher dedicated to high‑end staging and premium system integration. Like all the products of the LiveCore™ series, it has been designed for 24/7 heavy duty operation in mission‑critical use and features state-of-the-art 4K live processing capabilities, true seamless switching on all layers as well as an intuitive web based user interface which will help the operator unleash their creative potential. The Midra™ series of seamless switchers delivers Analog Way’s uncompromising processing and high-quality manufacturing in a cost-effective, easy to use range of products with outstanding value-for-price. Introducing HDBaseT™ support on new models QuickMatriX - H, Pulse2 - H, SmartMatriX2 - H and Saphyr - H further boosts the units’ versatility and offers more flexibility for fixed installations. These four new models feature up to ten seamless inputs, including two or four HDBaseT™ inputs supporting video, embedded audio and Ethernet pass through. The two first HDBaseT™ inputs also support PoE+. Each new model also features two outputs with mirrored HDMI and HDBaseT™ connectors. In addition to HDBaseT™ support, these four new models continue to offer advanced video effects for elegant AV presentations; real-time, ultra-low latency image processing; true seamless switching; advanced audio management and a user-friendly drag-and-drop GUI. The Midra™ series is controllable via standard automation drivers and advanced IT protocols. VIO 4K is a premium all-in-one video scaler, scan converter, switcher, coder and transcoder. Engineered to be road-hardened to survive demanding live event environments, it provides worry-free operation with maximum uptimes and low maintenance. VIO 4K can convert any input signal format to any output format up to 4K60Hz 4:4:4 and features the latest generation of connectivity, including HDMI 2.0, DisplayPort 1.2, Dual-Link DVI, 12G-SDI, Quad 3G- SDI, optical and of course legacy analog video. Anything in, anything out! VIO 4K also features exclusive high-quality processing engine and ultra-low latency processing as low as 1 frame. 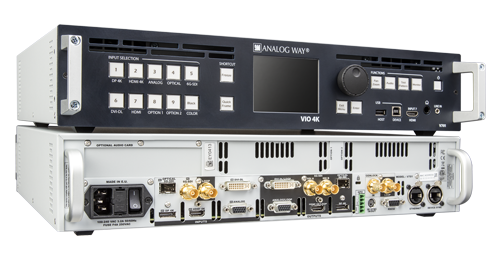 VIO 4K can also process embedded or de-embedded external analog/digital audio signals and support Dante™ audio networking.